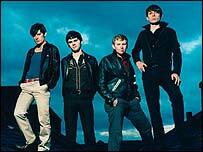 Scottish art rock band Franz Ferdinand have come second in a BBC News Online survey of music experts to find the artists likely to find success in 2004. The number one artist and the full top 10 will be revealed on Friday. Franz Ferdinand have a question they ask themselves every time they write a song, according to singer Alexander Kapranos. "Where's the fun in that?" they ponder at every stage, making enjoyment the top priority and ensuring they do not disappear up their own muso posteriors. Franz Ferdinand set out to prove that artistically credible rock could involve "really, really catchy tunes" that people could dance to, Kapranos says. The band were fed up with overly-serious bands in "that post-rock thing that seemed to be doing its damndest to avoid any bloody tune", he says. "We want people to go away from the gigs humming the tunes that we were singing. But at the same time bringing an edge to it." The four-piece have had a rapid rise to prominence since they met less than two years ago. Drummer Paul Thomson was working at the Glasgow art school where bassist Bob Hardy was studying. Kapranos was studying English at university but had friends at art school, and the line-up was completed when guitarist Nick McCarthy moved from Munich, Germany, to the city. But it could have been very different when Kapranos and McCarthy first met at a party. The pair almost came to blows after McCarthy adopted Kapranos' bottle of vodka as his own. "We were going to bash each other's faces in and then, just as it was about to turn one way or the other, I asked him if he played the drums," Kapranos says. "And he said 'yeah I do'. It turned out he couldn't play the drums at all but he'd come to Glasgow desparate to find new people to play music with." So McCarthy and Thomson swapped instruments and the quartet soon became a close-knit unit. "You're letting such a fragile side of yourself out when you're creating or writing music," Kapranos says. "To do that with people who are almost strangers would seem very strange to me. I think that we're very lucky that we're quite close. "To us, it's almost like the band is the grandest possible adventure you can go on with your friends. It's really really exciting." Their first gig was at an all-female art show and so they set out to make music that girls could dance to. Developing a DIY ethic from the start, they took over a disused art-deco warehouse in Glasgow, made it their base and renamed it The Chateau. The venue soon became legendary in the city - so well-known that the police spent a month trying to find it, eventually raiding it and arresting Kapranos. But the charges of running an illegal bar and contravening health and safety, fire hazard and noise abatement laws were dropped. The band took over an abandoned Victorian courtroom and jail instead, and named that The Chateau. The buzz about the band soon spread around the music industry and 40 record labels turned up to one gig in Glasgow - which the band thought was "totally ridiculous". "I'm really glad it was almost comical because we weren't overwhelmed by the seriousness of it," Kapranos said. They signed with independent label Domino, home of Smog, Sebadoh and Four Tet, in June. Their biggest musical ambition now, Kapranos says, is to make people think of "four daft guys that met in Glasgow" when they hear the name Franz Ferdinand. Who was that Archduke whose assassination triggered World War I again?